Is camping on your bucket list, but you're turned off by sleeping in a tent? Small caravans provide the solution. Here are 3 of the very best small caravans in the world today. Which one would you choose? That will depend on your circumstances of course, and most importantly what car you drive. Every make and model car has a different towing capacity so you need to match this up with the weight of the caravan you will be towing. Otherwise you might find yourself with a dangerous combination. Why buy a small caravan? There is an absolute plethora of small caravans on the market today which have almost as many features as the larger caravans. They are an affordable option for many young couples, small families, or retirees, and are a great way to get into the freedom and lifestyle that caravanning offers. 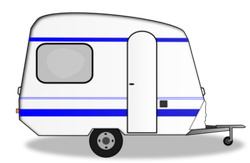 If you are considering purchasing a small caravan there are a couple of things you might like to consider. Firstly, what is the size of your tow vehicle? This is critical because every vehicle has a limit to what weight it can tow. You can usually find out by checking the owners manual of your car, or doing a search online for your particular car. Secondly, how often are you going to use your van and what level of comfort do you require. If you have a medium sized car you have plenty to choose from. Some of the small caravans coming out of Europe weigh as little as 750kg (1653 pounds) fully laden and the Australian A-Van Weekender (below) only weighs 350kg (771 pounds)! There are even smaller teardrop travel trailers from the USA designed for a Mini car. That is truely amazing but I guess you are wondering if they are really strong enough. The answer is ‘Yes’, because they are manufactured to industry standards that safeguard the consumer. The secret to a light weight small caravan is in the technology used. The latest advances in light weight, but strong materials are used at every opportunity from the ground up, including the chassis, internal panelling and cupboards, and durable external cladding. The popularity of caravanning has skyrocketed in recent years as more and more families and retirees take to the road to enjoy the freedom and adventure of this wonderful lifestyle. Make The Most Of Your Caravan! Don't leave things to chance. Look like a seasoned professional with all the essential hints and tips of caravanning..
Is this A-Van Weekender the lightest small caravan in the world? Do they get any smaller or lighter in weight that the 350kg (771 pounds) A-Van Weekender?. Maybe, but I haven't found one yet! (Please leave a comment below if you know of a factory built small caravan that's weighs less). The Avan Weekender has provided a new sense of style to the small caravan market in Australia. If you can only get away on weekends but don’t want to ‘rough it’ in a tent, then this could be the answer to your weekend camping adventures. The A-van weekender is comfortable and fully insulated. It has a generous double bed which measures 190 x 130cm (75 x 51 inches). If you are concerned about your fuel bill, and aren’t we all these days, you will find that your tow vehicle hardly notices this small caravan towing along behind. There is a large storage area that is easy to access under the bed for all your camping equipment, and there is an option to purchase a large add on all weather annexe for the rear of the van which extends the living area. Manufactured by Freedom Caravans in the UK it is not only the smallest available in that country, but also the cheapest. It features quality materials throughout, a new modern designer interior and an all weather poptop roof. It has an overall measurement of just 4.00 metres (13ft) which you would expect of a small caravan, a bare weight of 580kgs (1278 pounds), and a loaded weight of just 680ks (1499 pounds). The Freedom Microlite small caravan is currently priced at £6,995 (US$11,074) (AU$10,344) You should make your own inquiries for up to date price information. Small Caravans for Small Cars! The teardrop travel trailer is made in various forms around the world but I believe the ones made in the USA have a certain flare not found in other countries. As you can see by the image, they have done away with the idea that they must have a painted exterior. This small omission leads to the most stunning outcome with the highly polished aluminium skin showing the travel trailer at its best. This small caravan can be towed by a vehicle as small as a Mini, hence the name – Mini Teardrop Trailers. Enthusiasts from all over the world will tell you how much they love this version of the small caravan, and it certainly is a conversation piece wherever you go. A gas grill can be used at the beach; baseball games; on road trips; camping or even on your patio at home. A camping checklist takes the stress out of trying to remember everything you need to pack. A Colman propane camp stove is probably the most essential camping accessory. A hot meal at the end of a day in the great outdoors is something to really look forward to.